The Catalyst News PROFILE: SECRETARY OF STATE MADELEINE KORBEL ALBRIGHT by Charles Choi When Madeleine Korbel Albright was sworn in as Secretary of State on January 23, 1997 with a unanimous vote of confir mation from Congress, she became the first woman to hold that post. As such, she now would be fourth in line for the presidency, right after the Vice Presiden, the President Pro Tern of the Senate, and the Speaker of the House, if she were not foreign-born Albright was born on May 15, 1937 to Czechoslovakian diplomat Joseph Korbel. She sought political asylum in the United States at age 11 when communism took power in her country in 1948 After she graduated with honors from Wellesley College in 1959 with a B.A. in political science, she married Joseph Albright, the heir to a media empire, and had three daughters by him, They divorced in 1982. Albright received her doctorate from Columbia University in 1976, and was chief legislative assistant to Senator Edmund Muskie (who later became Secretary of State) from 1976 to 1978 She was a staff member of the National Security Council from 1978 to l 981, and was a research professor of International Affairs and Director of Women in Foreign Service Program at Clinton's alma mater, Georgetown University School of Foreign Affairs from 1982 to 1992. To add to her list of credentials, she was a foreign policy adviser to a number of Democratic presidential and vice presi dential campaigns: Ferraro in 1984 Dukakis in 1988, and Clinton in 1992. She has also sat on the boards of the National Endowment for Democracy, the International Media Fund and the Black Student Fund. Albright had already held a cabinet rank office when she became the first for eign-born citizen to hold the post of U.S. ambassador to the U.N. in 1993, and led the campaign that removed Boutros Boutros Ghali from the office of U.N. Secretary General. She also exchanged comp l iments with Senator Jesse Helms during her tenure as ambassador. In fact, Helms was one of the first to issue a pub lic statement of congratulations on her appointment. Helms is known for his contempt of the U.N. Former President George Bush, who also was a fonner U.S. ambassador to the U.N., supported Albright in her recent ef forts to get a global chemical weapons ban ratified by the Senate and to pay $1 billion in arrears to the United Nations. Albright earned a reputation as a spe cialist on Eastern Europe and the former Soviet Union as adjunct fellow in Soviet and Eastern European Affairs at the Center for Strategic and International Studies from 1981 to 1990. She has ar gued for a more active U.S. role in the promotion of democracy in these coun tries, as well as assistance in their transition to a market economy. She has pressed hard for the establish ment of the War Crimes Tribuna l for the Balkans and Rwanda in order to establish "a precedent that will deter future atroci ties". She has also defended American intervention in Haiti and Bosnia with a passion. In his memoir, General Colin Powell remembered a question she asked him during a discussion about Bosnia, where she said, "What's the point of hav ing this superb military you're always talking about if we can't use it?" On the other hand, she said a strong military can only go so far. "Force, being a blunt instrument and one with some times extreme consequences, cannot solve all our problems. There will be many oc casions, in many places, where we will rely on diplomacy to protect our interests, and we will expect our diplomats to de fend those interests with skill, knowledge and spine." During her testimony for the 1998 State Department $19.45 billion budget request last Thursday, Albright said that questions of religious freedom are central to U.S. foreign policy. She was surprised by the recent media reports about three of her grandparents when she found out they were Jews who died in the Nazi death camps in Czechoslovakia. Albright was brought up a Roman Catholic and later became an Episcopalian. "My childhood understanding of life under a totalitarian threat has already left SEE "ALBRIGHT" ON PAGE 4 February 18, 1997 3 OUTSIDE THE IVORY TOWER International In Geneva on Saturday, 67 nations committed to an agreement that would liberalize their telecommunications mar kets. It will unlock state telephone monopolies to foreign companies. The agreement is a victory for the United States, which won more concessions from nations which had refused in past negotiations National Astronauts will take a fifth space walk to repair rips in the protective foil of the Hubble telescope. Makeshift patches of insulation fabric will be at tached to the telescope using wire and rope. Engineers suspect the tears were caused by variations in temperature and ultraviolet rays from the sun. The dam age, which appeared extensive, was not seen when astronauts last visited the telescope in l 993 Astronauts also up graded three more components of the telescope during their seven-hour space walk. These included the replacement of a faulty electronics box and a broken flywheel device used to maneuver the telescope, as well a the installation of a new digital tape recorder. The American Airlines pilots' strike ended Saturday after President Clinton ordered a 60 day cooling-off period. Few flights ended up being canceled, but many passengers switched airlines as a result of the strike. Had the strike occurred, it would have cost the U.S. economy an estimated $200 million per day. Four hoodlums broke into the home of 75 year-old Dorothy Cunningham and 61 year-old Marty Killinger late one night and demanded their car keys. The youths (one 20 year-old and three teens) failed to realize that these women were "gun-slinging grandmas" and were forced to flee to the hills as shots were fired over their heads. A short ceremo n y in Moses Lake, Wa. honored the women as Grant County Sheriff Bill Wiester said "This is a clever message to crimi nals that senior citizens won't tolerate this type of behavior from these young punks." 6 The Catalyst Contributions February 18, 1997 CONSERVATION NEWS Contributed by Anne Tazewell I am pleased to announce the avail ability on campus of two different kinds of recycled paper The "Earth White is a 100 % recycled 50 % post consumer paper that has an off-white appearance whereas the other paper is made from 20 % postconsumer fibers but is "white". In considering recycled paper it is important to note the content of post-consumer fiber. This percentage figure refers to the actual amount of paper that has been reused, whereas the rest of the recycled content figure reflects the use of the end of the roll trimmings that are usually discarded during the manufacturing process. Virgin bond paper will continue to be available on campus but it will be slightly more ex pensive than the recycled. This price difference is an indication that all of our recycling is paying off. For years recycled content paper has been more expensive than virgin ". Until recycling programs matured and plants were retrofitted it cost more to make the environmentally re sponsible choice and buy recycled. By purchasing recycled paper we are doing our part to "close the loop"; reducing waste as well as insuring the continued success of recycling programs. Paper products make up the largest part of Florida's waste stream: 5.9 million tons each year. However, using a ton of paper made from 100% wastepaper saves 17 trees, enough energy to power an average home for sixmonths, 7000 gallons of water, 60 pounds of air polluting effluents, in addition to three cubic yards of landfill space and the tax payer dollars that would have been used for waste-disposal costs. Last month our campus recycled over two tons of paper. We are making a difference not only by recycling but by using recycled products. Ask professors to have class handouts printed on the "Earth White" paper. When getting something copied at the campus copy shop request that your job be printed on the 100% recycled paper. Recycling doesn't eliminate our solid waste problems. In fact, experts say that a 40% paper recycling rate will barely keep pace with the expected increase in usage. Reducing our consump tion is the key to successfully reducing our collective environmental impact. Following are a few suggestions that would help our campus reduce its paper consumption: use both sides of the page for printing papers, encourage professors to reserve reading in the library rather than printing class handouts and use paper that has already been printed on one side by xing out the printing on the re verse side. Small changes in our day-to day activities can make a big difference in the amount of solid waste our campus generates. SAC MINUTES MEETING OF FEBRUARY 6, 1997 FROM THE FINANCIAL AID OFFICE Keith requested $800 for the "Valentine Inferno" PCP for decorations, structures, and a t-shirt loan. Allocated: $800. Christan Blystone requested $375 for a ping-pong tournament for a table, two paddles and balls. Allocated : $375. Trina Sargalski requested $20 for hors doerves served at her Wall. Allocated : $20. Julie Allen and Eric Piotrowski requested $100 for a Taco Bell and Mountain Dew party. Allocated: $100. Michael Hutch requested $150 for Pillowbook. Allocated: $150 Brynne Romano requested $10 for Student Court. Allocated: $0. She was instructed to see Alena Scandura. Motion to call the Health Department and advise of scabies. MacLab Update: 1. TA hours on the way. 2. Program training/work shop in the works 3. Perhaps an ethernet cable. Hazen Komraus was selected as the SAC Chair. The SAC will start advertising for the RA Selections Committee The SAC will hold marathon allocations the weekend of February 22. When filling out the 1997-98 Free Application for Federal Student Aid renewal forms, pay particular atten tion to question #52. It has come to our attention that the question is misleading many students. The question states, "parent(s) number in college in 1997-98." The correct response to the question is the total number in the household who will be in college at least half time. The question is phrased as above only on renewal forms. Question #52 on the standard 97-98 FAFSA sstates, "number of college students in household in 1997-98 An incorrect response to the question COULD effect your financial aid award Correcting a wrong response requires the verification process, which is often time consuming. If you'd like to file your 1997-98 renewal automati cally, stop by the financial aid office and use FAFSA Express. The application processing time is usually cut in half Remember: keep your permanent address and tele phone number, as well as your local telephone number updated w ith the Registrar's office. During the semester, correspondence and checks are mailed to students' mail boxes. During breaks and in the summer, mail is sent to permanent addresses. For scholarships, check the Financial Aid Office, PME 119, for local scho l arship information. The web site address for scholarships is: http://www.fmaid.org/. Select fastWEB SRN Express, MACH 25 or ExPAN. 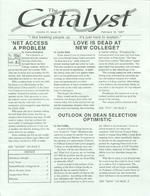 The Catalyst Editorials/Opinions February 18, 1997 7 EDITORIAL: CONGRATULATIONS Finally. A virtually molesta tion-free PCP. Perhaps the reason for this was the lack of off-campus advertising and therefore the lower attendance. Perhaps "visitors" were suffi ciently warned to be on their best behavior. Maybe the visitor passes scared some into behaving like princes and princesses. Maybe it was purely a coincidence. Regardless, it was refreshing to attend a PCP which involved com paratively few harassing stares, drunk losers, embarrassing incidents and broken bottles. Especially impressive was the behavior exhibited by the univer sity police throughout the evening and their appropriate response to a delicate incident at the onset. The students who assisted the officers also deserve recognition for help ing to pacify a potentially disastrous situation. Special thanks to Jake Reimer, Keith Bentley and Keith T. for ac tually getting off their asses and organizing The Inferno. KUDOS TO THE WOMEN & MEN OF 'ROUGH ROAD AHEAD' Contributed by Ofc. Hugh Roarty You all know what happened Saturday night at the beginning of the PCP, but there were side events that eclipsed the unfortunate portion. As I pulled up to the wall in the Blazer, I knew something was happening other than "someon e is trying to stan a fight." As I moved into Palm Court to the entrance to Second Court, students yelled down from a balcony, "Roarty, be care ful." One doesn't have to be a Rhodes scholar to figure out that this one may not be a piece of cake. As I got to the center, I was gratified. There was a bunch of stu dents helping Officer McCue restrain the individual. They helped handcuff him. Some of you would question this, but anyone who was in close proximity to the individual knows that it was to prevent him from hurting others and himself. So, to the balcony people and those who were in the thick of it helping Officer McCue, I salute you. The University Police Department in its en tirety salutes you. You are the few ... the brave and the proud. Women and men who have been part of a rough road ahead. To the individual involved: get a life. You owe a lot of people more than just an apology. Talk to me in private and we'll go over the facts of life and just how lucky you are! To the blue-haired guest that may never see this, thanks and a whole lot more. Thanks to all for reaffirming my faith in the student body, individually and col lecti vely. Side note: wasn't that dance recital at Sainer over the weekend fabulous? Especially interesting was the use of can dles in the fourth number. Now if we could only get Ms. Mason to perform the dance she is best at, we would have a fan tastic show. Angus! Stand ready! Riverdance, move over! Contribution Guidelines JJf) 1 .. 1 J .. f)fJ February 11, 10:30 p.m. Bike stolen. $150 value. The bike was locked. Owner returned from ISP and it was gone. February 12, 1:12 p.m. Three solicitors (from a hairstyling salon) were given a verbal trespass warrant and told to leave. February 14, 1:10 p.m. USF flag was reported missing from the library. $60 value. It had been replaced with a NCLF flag. February 15, 10:12 p.m. Student was committed to the hospital under the Marchman Act for intox ication. February 16, 1:44 a.m. Non-stu dent was arrested for underage possession of alcohol, obstruction and trespass after warning. Was taken to jail. February 16, 3:52 a.m. Student was arrested for underage posses sion of alcohol and for giving alcohol to someone under the age of 21. Letter to The Editor: A reader's response to previous articles, letters and/or editorials, or an opinion that is intended to be shared with the student body. Letters to the Editor should be no more than 250 words, and are not a forum for free advertising. Contribution: A factual article written by someone not on staff. Contributions should be informative and pertinent to the interests of New College students as a whole. Contributions may range in length from 250-500 words. Guest Column: A solicited opinion piece. Guest columnists do not necessarily represent the views of the Catalyst, but rather opin ions of which we feel the New College community should be made aware. Guest columns may range in length from 250-500 words. All submissions should be received by 5:00p.m. Friday in order to appear in the following week's issue. 8 The Catalyst Joseph L. Wieczynski Professor of History at Virginia Polytechnic and State University, will give a presenta tion entitled "Gorbachev and the Collapse of the Soviet Union" on Wednesd ay, Febru ary 19 at 3:30p.m. i n the College Hall Music Room Everyone is invited! We are organizing a coffee house for Friday February 21 in the College Hall Music Room. It will be a promo tional event for WNCR, the upcoming radio stati o n We'll b e a s k ing for donations of CDs tapes, and equipment. For more information contact Kaia Roman or Josh Tickell. There will be a Faculty-Student Coffee on Wednesday, February 19 at 4:30p.m. at College Hall. There will be free subs and de s serts for everyone so come out for gr e at food and con versation. Food Service committee members will be going door to door to collect the cafeteria china. Dis h e s s hould be washed and dried. Please return them! If you would like to tutor at Newtown for a bunch of neat kids, here is your chance Volunteer f o r the North County Educational Assistance Program a community run facility. Work from Monday to Wednesday from 4 : 00 to 5 : 30 or 6 : 00 p.m. and you don t need a car. Contact Amy Mormino at Box 389 or call 355-8748 for more infom1ation. Spanish Club (almuerzo espafiol) meets on Wednesday at 12 noon in Ham Center. Join us for food fun and conversation. Look for the pinata! Black Pearl 5 piece export series drum set for sale with all hardware but no cymbals. Nice kit. Cont ac t Aaron Gustafson via box 237 or e mail fritzmag@ aol com. PCP t-shirts are still for sale for only $10. Contact Jake Reimer or look for a sale in Hamilton Center. Announcements February 18, 1997 CAREER CENTER Teach in East Central Europe 1997-98: The Language in Education Division of the Graduate School of Education at the University of Pennsylvania now offers a special pro gram for qualified graduates of four-year colleges who are interested in Teaching English as a Foreign Language in East Central Europe Application deadline: April 11. Tropicana Internship: The Corporate Communications Department is offering an intern ship in general administrative work as well as writing press releases and an on-line newsletter, compiling data on marketing strategies, and conducting tours for invited guests Additional information is available in the CRC office Alaska Wildland Adventures (AWA) Summer Positions: AWA oper a tes small group natural history trips of 5 to 12 days in length and rafting/fishing programs on the Kenai River Summer positions begin in mid-May with an intensive training period and run through mid-September. Looking for high energy, people-oriented outdoor leaders and hospitality staff Salaries are dependent upon experience. Living conditions for staff are somewhat rudimentary. Outside Classroom Experiences (OCE), Inc.: OCE, in Altamonte Springs FL, is looking for applications for summer counselors with a major of Elementary Education, Social Services, or an interest in the education of children Applicants can apply through web site: www.oceinc com or through email at counselor@oceinc Camp Counselors Wanted: Manatee County and Sarasota Country arc looking f o r Camp Counselors for their summer program. If interested stop in the CRC office. Picker International: Picker International is a worldwide manufacturer of high tech med ical diagnostic imagin g equipment and ha s an immediate part time pos ition av a ilable in its Health Care Products Division. If interested, stop in the CRC office. CIEE: Council on International Education Exchange Teach English in China: Teach in China is designed to be self-financing, you will be paid locally and receive room and board from your host institution. Teach 10-20 hours per week, socialize extensively with other faculty and students. A travel allowance will be paid by many of the host schools to help you travel around China in your leisure time. Any questions call 1-888COUNCIL. Global Leaders of Tomorrow Essay Contest: The Sunkyong Group of Korea, and LeaderShape, Inc. are sponsoring an essay contest. First price is $2,500 + one week edu cational trip to Korea Entry deadline: April 15th Additional information available at web site http://campus.net or call 212-906-8138. Renaissance Collegian of the Year: Win an Overseas Art Adventure from Renaissance Hotels and Resorts. Renaissance extends a national search for the college student who demonstrates outstanding scholastic and artistic achievement in anything from dance and theater to music and the visual arts. Complete contest details are available on web site www.renaisaancehotels com or calll-800-842-6394. Public Policy and International Affairs (PPIA) Fellowship Program: PPIA Fellowship Program prepares students of color for future careers in public policy and international af fairs through activities leading to a master's degree. The Senior Program provides an option to graduating seniors such as language study, internships, and specialized study preparation for graduate school. The PPIA covers such expenses as tuition and living ex penses, as applicable. If interested email: alwdges@uclink2 berkeley.edu.